Cloud Atlas Review: What Does it All Mean? First and foremost Cloud Atlas is the most ambitious film we've ever seen. The movie spans generations, continents and universes while its ensemble tackles a half dozen roles in six existentially connected storylines. Tom Hanks and Halle Berry may lead the cast, but Cloud Atlas is truly a group effort on so many fronts. The success of the film lies with the astounding love of language and story in author David Mitchell’s blockbuster book. Filmmakers Tom Tykwer and Lana and Andy Wachowski penned a script and crafted a film worthy of the book’s scope and breadth. Then there are the hundreds of donors across the globe that put money together, outside of the studio system, to ensure the $100 million “indie” film even saw the light of day. Creatively, everyone involved took a pay cut to ensure that Cloud Atlas be the earth-shaking movie it could be, as its ensemble of Hanks, Berry, Hugo Weaving, Susan Sarandon, Jim Broadbent, Hugh Grant, Jim Sturgess, Doona Bae, Ben Wishaw and James D’Arcy could then dive in and create a modern masterpiece. “The mark” is a birthmark on six different characters that looks like a shooting star. There is one in each of the six storylines and how they interconnect is nothing short of ingenious storytelling. Mitchell may have provided the framework, but the Wachowskis and Tykwer have performed a movie miracle by pulling out the most cinematically worthy moments in the book and weaving them in a web that makes sense, resonates and most importantly, makes you forget that you’re witnessing a three-hour film. Among the highlights for Movie Fanatic is the part of the story involving the tragic tale of love between Winshaw’s Robert Frobisher and D’Arcy’s Sixsmith. Prepare for a weep of the highest nature as their story progresses. Berry and Hanks show killer chemistry on several fronts, from the 1970s San Francisco-set journalism exposé on nuclear power segment to the future (or is it past?) post-apocalyptic tribal journey that audiences gradually learn may hold the key to all of the intertwining plots. Then, there is the wizardry of Weaving. 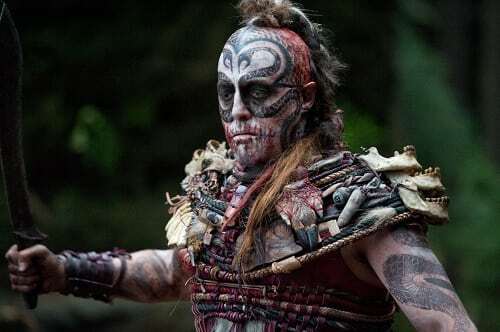 The star of the upcoming The Hobbit is a clear antagonist throughout Cloud Atlas, yet the six parts he plays are so varied in their motivations that it allows the actor to push himself further into a pitch-perfect performance across the entire film that will go down as his absolute best. Our screening was weeks ago and yet in the time that has passed between then and the writing of this Cloud Atlas review, this writer cannot shake it still. The film produces a rush of adjectives, not the least of which is: Profound, brilliant, beautiful, unforgettable and epic.